3am. That’s what time I had to get up for this race and was the earliest wake up I have ever had for an event. Maybe I hadn’t thought this out well enough. Not to mention I was coming into this race not at all rested and having done a 100 mile ride and 16 mile run the weekend before. Pretty exhausted all in all but this was just a warm up race leading up to IM Canada. Thankfully I had done all my packing and coordinating in the days leading up to the race so after a change into my race outfit, and making my coffee and oatmeal I was out the door around 3:50am and on my way to Oconee. I arrived on site around 5:20am and pulled right up next to Cristin and Stephanie and got to go through check in and transition set up with them. Once the three of us set up our area and said our hellos to other friends we made our way down to the water to check out the temps and course. 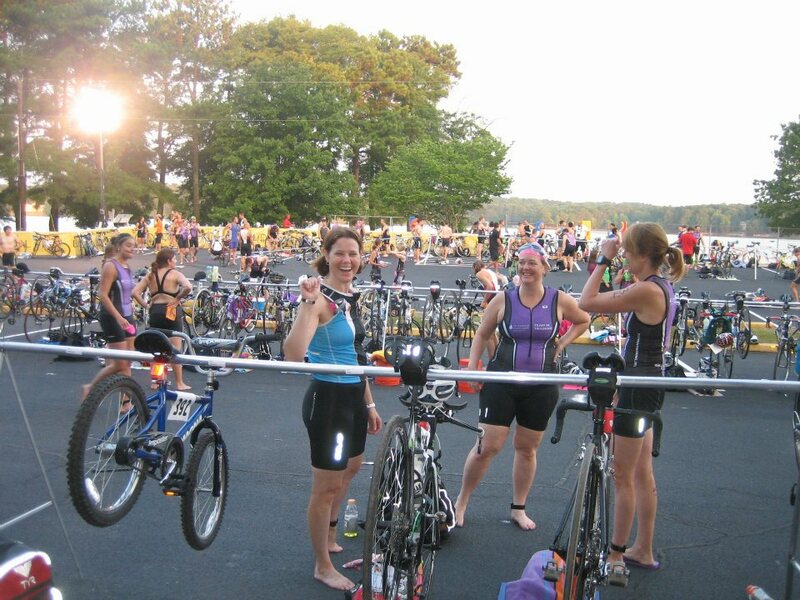 We were just contemplating the wisdom of doing a warm up swim lap when we found out from other spectators that a whole row of bike racks had collapsed. As it turned out, all of us were on that row. We hustled back to transition to check out our bikes and were informed that we should move to another rack. Once we moved, that rack started to collapse and then yet another row of racks across transition also began to fall. Needless to say, this was frustrating not only for the participants but also for the race organizers. The start of the race was delayed about 30 minutes as everyone tried to find a safe place to put their bike and other gear. Eventually the entire field of athletes found somewhere to put their bike and it was time for the race to get under way. I was a little thrown by the multiple bike moves as I am not one to ‘roll with the punches’. It was kind of amusing to look around and see the different reactions of the participants. Some were unfazed, some were mildly annoyed like me, and some were full out upset. The race director was very apologetic and we all moved down the beach to get the swim under way. Blood Sugar before swim: 168 and falling. 1 gel slurped down before swim and one stowed in my tri jersey project – just in case. Talking to Joyce and Michelle in transition during the fallen rack comedy of errors. Michelle and I were some of the few who opted to keep our bikes on the rack. 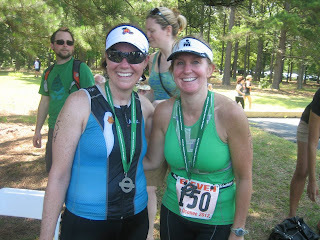 Tri Camp buddies Lauren and Stephanie. I have that same tan pattern too! This was a deep water start with all the other women in the olympic heat but with a lot of room to spread out. The course was a typical triangle set up with the sprint participants doing one loop and the olympic participants doing two loops. When the announcer started the olympic women I didn’t intend to go out with any real urgency but realized rather quickly that I had gone out a little harder than I perhaps had intended. I could see the other women in pink caps when I turned my head to breathe but pretty quickly ran up to the men’s sprint heat in front of us when coming around the first buoy. At this point I was a bit warn out from the pace I had been keeping but didn’t feel like I was swimming particularly well or clean. I decided to slow it down and concentrate on swimming smooth and clean to the next triangle point. This didn’t go exactly to plan though as I had to swim through a lot of the men’s sprint field. I don’t like to swim over people, both because I am not particularly that great a swimmer and I also don’t like to mix it up with participants who might be struggling. So I did my best to give everyone a pretty wide berth. On my way back to shore for the turn around to lap 2 I tried to pick up the pace again and noticed that I didn’t see any other pink caps and was in a bit of a no man’s land. 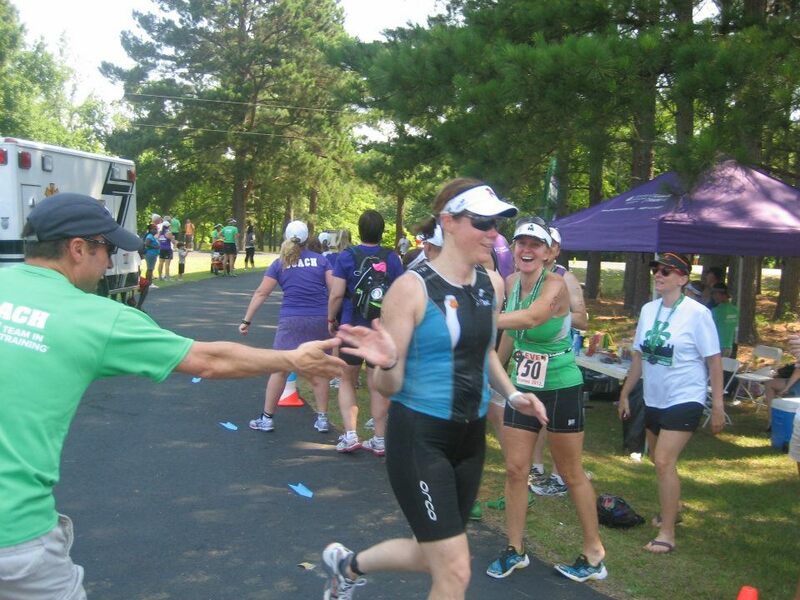 I began to get concerned that perhaps I was having a bad swim and had fallen behind the pack I should be with. I refused to look at my watch though as I didn’t need confirmation of a bad result. Again, I just focused on keeping up a good pace and trying to actually kick. Participants were definitely going off course at this point and cutting the last turn buoy short. I made a point to round the green turn buoy for lap 2. Lap 2 went fairly smoothly and I found myself swimming through and with a lot of green caps – the men’s olympic field. This was the confirmation I needed that I was actually having a good swim. I felt a little more comfortable swimming closer to these guys but gave distance again if I sensed any agitation. I kind of went a little wonky and tracked back and forth coming back to shore to finish the swim but managed to swim right up to shore and didn’t stand up until my hands scraped the bottom. A quick look at my watch confirmed my best swim result in an olympic: 29:47. Even better than my time at Philadelphia Insurance which was in a river with a current. 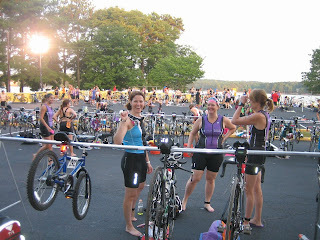 Obviously they put the swim out mat pretty close up to transition so my official time doesn’t reflect under 30 minutes. 2nd in my age group is a great accomplishment for me as swimming is not my strength, that may speak more to the low swim strength of this field, but hey, I will TAKE IT! This was a swim without a wetsuit and the water was a little choppy the further out you were so it wasn’t an easy swim on paper. I’ve obviously come a long way with the swim this year both technique wise and confidence wise. This is a super quick T1 for me. Typically for any race distance less than a half I don’t do a blood stick in T1 and instead rely on my continuous glucose monitor to kick in and let me know where my blood sugar is. I didn’t feel like I had a low and didn’t want to blow a good time so I put on my bike shoes, grabbed my helmet and sunglasses and was off. This bike started out pretty well. This was a standard north Georgia course; rarely totally flat and mostly rolling with a couple of kicks uphill and down. I felt strong and started passing people right away but noticed that I wasn’t recovering from harder efforts as quickly as I normally do. I reached down around mile 5 to switch the view on my bike computer and it popped off onto the road. Oops! No split time is worth the cost of me having to buy a new wireless bike computer so I got off the bike and grabbed it off the road. I definitely lost a minute or two there and had to re-pass some people I had passed previously. I then felt my CGM buzzing in my jersey pocket. I didn’t feel low so knew I must have a high going on. When I pulled my CGM out of my pocket I was dismayed to see HIGH on the monitor which means my blood sugar was over 400. Bummer. I had no option to correct my high by taking on extra insulin because I had left my pump controller in transition (DUMB). So taking in nutrition at this point wasn’t a great option since that would certainly drive my blood sugar even higher. My only option was to press on as hard as I could and hope that my blood sugar would fall with the effort in enough time for me to start eating enough to fuel for the run. Other than the high blood sugar the bike was fairly uneventful. I went by one woman in my age group and I only noticed one women in my age group go past me but it was clear that she was faster than me so I didn’t try to hold on. Towards the last 8 miles of the ride I noticed that my energy dropped off precipitously and a headache set in. I checked my blood sugar only to find that it still had not dropped so eating was still not an option. My speed dropped off and I was downright irritable rolling in to transition. I ran through transition in my bike shoes and got a congrats on my ability to run in cleats from a couple competitors. Ha! That lightened my mood a little. I got to my transition area and did a blood stick to confirm my blood sugar. 358. I did a quick bolus correction into my pump and stuffed it and a bunch of gels into my jersey pockets. Switch to running shoes, exchange helmet for visor and off again. All in all, a good time considering there was a blood stick involved and some fumbling with stuff. Unfortunately, I forgot to put on my race belt with my number. Oops! As I left transition I noted that my time was 1:47. I figured that a sub 3:00 was still in my grasp even with the possibility of a tough run. I already knew this was going to be an ugly run but I didn’t know quite how ugly. I felt pretty bad from the start but managed to run the first half mile out of the park as it was pretty flat. Once we left the park we took a right and headed uphill and there was very little flat for the next 5 miles. This course was ROLLING and the toughest run course I have experienced in a tri. It would have been fun to ride but was an absolute drag to run. It was also starting to get super hot. Every time the road headed uphill I couldn’t sustain my pace and began power walking. Eventually the power walking turned into a slog. It just got uglier and uglier and my frustration was growing at the same time. About 2 miles into the run one of my training camp friends, Stephanie, came running by looking FANTASTIC. I was excited for her but it highlighted just how bad I felt. Finally my blood sugar began to fall so I felt safe to start taking in some gels. I approached the turn around and saw Stephanie come running back toward me. She cheered me on but I told her I wanted to cry. And it was true, I really wanted to cry at that point out of frustration and anger, but of course there was no point. After passing the turnaround I saw my TNT friend, Cameron, approaching. This made me feel a little better because at least I knew Cameron would have a good word for me. Once Cameron did catch me I explained the situation and he pointed out that I had simply bonked. For some reason this simple and true fact had escaped me. It was inevitable that this was going to happen since I hadn’t eaten anything on the bike but as this wasn’t a mistake I typically ever make I wasn’t familiar with the feeling. It was comforting to know this wasn’t a matter of not having fitness or strength. I ran/walked the next mile or so with Cameron and then told him to go on. I knew I was getting close to the end and was going to make it and was actually starting to feel marginally better so the gels must have been kicking in. A sub 3:00 time was no longer in my grasp but perhaps I could still do under 3:05. As I turned toward the park and back on to the flat half mile I was determined to shuffle/run to the end in order to get to 3:05. Coming down the finishing chute I had someone else in my age group come running by me. Despite the desire to chase her down I absolutely didn’t have it in me and already felt like I might vomit. Grrrr. I will be looking for that competitor in future races when I’m 100%. Pretty close to the end. See how red my face is? Yep – I lost a LOT of time on the run. On a better day I am quite sure I could have done this race in 2:50. Blood sugar at end = 274. I talked to Vic Kinnunen, who is a member of Triabetes and quite an accomplished diabetic athlete after the race. He offered me a valuable piece of advice regarding a high during a race. Treat the high and follow your nutrition plan. I won’t make the mistake of leaving transition again without my pump controller, no matter how short the distance and won’t ever risk bonking again. All in all I can’t be too disappointed - bring on Ironman! 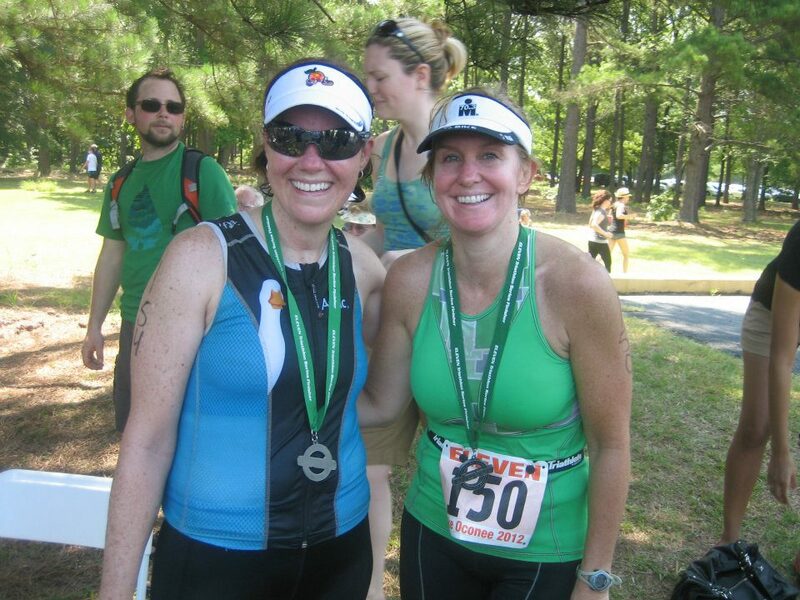 to finish second in our age group. That was fast swim! Great job!